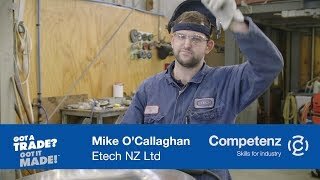 Congratulations to Competenz butchery apprentice Vernon Atutahi from New World Marton who yesterday took out first place in the Lower North Island regional final of the Competenz Butcher Apprentice of the Year competition. The competition is part of Retail Meat New Zealand’s annual event for New Zealand’s aspiring young butchers. The regional final saw entrants compete in an intense cutting test where they had two hours to turn a beef rump, pork loin and a size 20 chicken into a display of value-added cuts. Entrants also took part in an interview and sat a written exam to test their communication skills and knowledge of the trade. Vernon says he is looking forward to moving onto the next stage of the competition, the national finals, to gain more experience. “At first butchery was just a job, but within a few months it became a passion. I’m always hungry to learn more, and being involved in this competition gives me the opportunity to increase my knowledge,” says Vernon. Vernon has more work ahead of him to prepare for the Grand Final on 10 September at Shed 10 in Auckland, where the winner’s prize includes an international butchery study tour. Congratulations too to Justin Hinchco from New World Havelock North who took out the Alto Young Butcher category.